It goes without saying that retail fit-out is very important for brick-and-mortar businesses. A shop interior is the first impression customers will have of the business. And in the contemporary competitive market where image is everything your shop interior is like your business card. It should not just reflect your brand identity; it should also be highly appealing to your target audience. When you are designing the interior for your shop, it’s crucial to not only consider what will create a functional space, but also what will deliver a superior shopping experience for your customers. So what is your brand like? How do you want it to be perceived by people? How can you impress your visitors? The interior design of your shop will depend upon who your customer is. Whether you are a hairdressing or beauty salon, a family-friendly cafe, or a high-end luxury clothing brand, your interiors need to appeal to your customers and reflect who you are as a brand. For example, if you target a youth segment, your aesthetics should be trendy and dynamic. 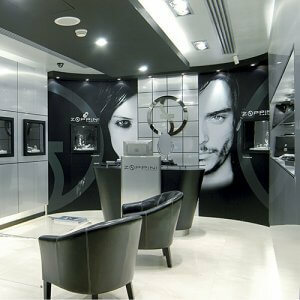 For a luxury segment, as in a premium quality jewellery store, create interiors with opulent appeal. A store with a mass-market target will benefit most from having a modern and practical interior, whereas a shop targeting kids and their parents will ideally be fun and vibrant (as well as durable and easy to care for). 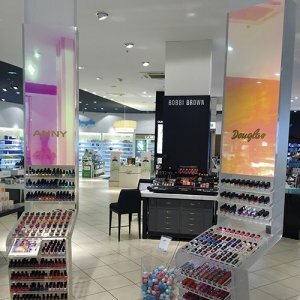 Creating the perfect retail interior comes down to selecting the right idea, employing professional shop fitters and getting the right materials for the result you want. Zenolite is a fantastic alternative to glass wall panels, offering high gloss finishes in a range of colours. It fits over new or existing walls and will not scratch or stain. Easy to clean, it is ideal for stores that cater to a young and vibrant customer base, and is perfect for businesses from hairdressing salons and luxurious restaurants to clothing boutiques. agnet, while some can be used as chalkboard or markerboard: style your interiors and communicate with your customers with this type of surface. erior at reasonable cost is something you seek, then look no further, Sibu decorative panel is the answer. Wilsonart Custom Laminate is a fun and easy alternative for high traffic interiors. You select your colours, design and patterns, and Wilsonart prints it for you on the laminate; shop-fitters do the rest. Your own design and the unprecedented quality of Wilsonart laminates can accommodate any brand and any application. From wall panels in childcare centres to tables and chairs in a fast-food cafe, the options are almost endless and come at a great price. When you’re considering your retail fit-out, consider first and foremost who you are as a brand and how you want to be perceived. Decorative surfaces create the atmosphere of your store, supporting and strengthening your chosen fit-out and your retail concept. Have fun, be creative, and design a space you and your customers will love. The ideas, views and opinions expressed by the authors in this blog do not necessarily reflect the position of HVG Decorative Building Products. All data and information provided in this blog is for general reference and inspiration only and cannot be used as an official guide to any interior building jobs. The company will not hold liability for any errors or omissions in this information or any losses or damages arising from its display or use.